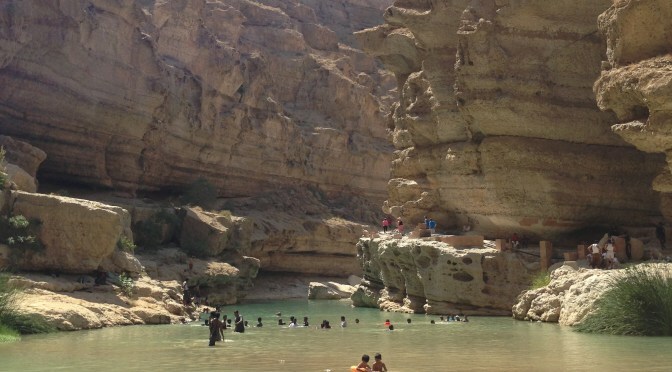 It is a very popular wadi located in the Al Sharqiyah region in Oman. Tourists usually come here for the nature, swim in the fresh water pools or simply to have a barbecue. It lies 140 kilometres from Muscat, located in Tiwi, part of Sur in Al Sharqiyah South Governorate. Certain areas can be covered by boat and some people take pleasure in a refreshing hike through this mountainous region. The key attractive spot of the wadi is the water fall in the cave. You can have an adventurous and thrilling journey to reach here after a roughly 40 minutes of hike and swimming in 2-3 pools. And the pools are always full with clear blue water! A combination of high rise mountains and endless shoreline at such close proximity is the highlight of the scenic beauty of this place. Some proactive measures taken by the government makes the overall journey to the place safe and comfortable. The place gets very busy during public holidays as it is the favourite picnic spot of many families where they come for a thrilling journey with their children. So if you are a person who don’t like crowded wadis, better plan the trip in weekdays. Followed by breakfast in the hotel, you will meet the Omani Guide at 8:00 a.m.
On the way, we will take a halt at Sink Hole. In the mean time, you can have picnic lunch during a short break. Once everybody is ready, we will drive back to Muscat.